The fourth most valuable sports franchise in the world added to their endorsement arsenal once again. The New York Yankees concentrated on off-field performance for once to focus on fashion. As reported by Women's Wear Daily on Monday, Donna Karan New York Inc. (DKNY) agreed to a long-term, multifaceted investment deal with the New York Yankees. Full details of the partnership were not released as it is still in development but the first and most obvious step is a DKNY billboard above the outfield bullpen in right-centrefield. The billboard features DKNY's logo with the Manhattan skyline in the background, tieing in the heritage and branding of DKNY with the Bronx Bombers. There are also advertisements for DKNY 2010 editorial campaign featuring male models in Yankee navy suits paired with blue ties and stark white shirts, but sadly, no pinstripes in sight. Shouldn't that be an obvious homage to the team? It's not a new initiative for a fashion brand to take interest in involving itself with professional sports. Many athletes, like Yankee captain Derek Jeter, have signature shoes and some even have their own clothing lines. Luxury accessories, like Tag Heuer watches have a variety of high-profile athletes endorsing their products in play and on billboards. Sean Avery, another New York sportsman, has interned at Vogue and now serves as a collaborator, pitchman and muse for the simple and chic menswear line Commonwealth Utilities. However, this is a landmark deal because it was one of the first times for a ready-to-wear fashion line to partner with an entire team and have such a visible presence in a sporting arena. It's not just providing the Yankees with suits, but integrating two brands from one city for both a partnership and profit. It's a natural fit for both parties because athletes are role models and physical ideals to the large portion of the population. Athletes are high paid, in incredible shape and live at different standard than the rest of us - what average man wouldn't want to date Kate Hudson or have a garage full of the most exclusive cars on the planet? Now, not only can a man dress like his favourite athlete when he's playing sports or watching the game on his couch, but also when he's at a business meeting or taking on the town. A suit is staple in the modern man's wardrobe, and in the life of most New York men, and so are the Yankees. 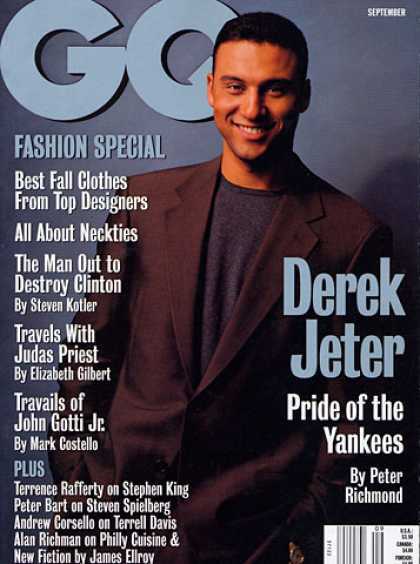 The advertisements feature male models but it would make sense to use the Yankee players themselves for editorial images, especially since many have modelling experience. Baseball players have height, great shape and strong shoulders that every designer would love to dress. The Yankee roster also features a diverse group of men, some young, some veterans and some very attractive that only men would want to be, but women would want to be with them. (I suggest Brett Gardner, Curtis Granderson and of course, Derek Sanderson Jeter). The conglomerate owner of Donna Karan International, LVMH (Louis Vuitton Moet Hennessy), is a global brand and one of the most powerful in the fashion and lifestyle market. The campaigns will circulate the New York state of mind and wardrobe worldwide, much like the Yankee games and fans. DKNY and the Yankees may pride themselves on being brands that are synonymous with New York City but in reality, they are both worldwide franchises. New Yankee Stadium can hold 55,000 a game while YES Network (Yankees Entertainment and Sports Network) are accessible anywhere in the USA. Online streaming of games are available through YES, MLB.tv and not so legal channel surfing websites. DKNY clothing and accessories are available worldwide and are at an accessible price point. Not everyone many can afford a high fashion $1500 Dior Homme suit from an exclusive retailer. While DKNY's modern slim suit is accessible to more body types but also at $595 and available at national retailers, more markets and men with buying power can access it. The Yankees are a team with classic uniforms and are the chosen team of the masses, so DKNY can try to become the main purveyor of pinstripes for these legions of fans: a classically cool wardrobe for an iconic team. All the extensive details of the deal including length are not disclosed but it seems that DKNY is ensuring that their slogan, "[DKNY] is not just about clothes. It's about a lifestyle" lives up to their agreement with the Yankees. Besides the advertisement directly in New Yankee Stadium and the branded editorial images, DKNY is ensuring that their brand is closely associated with the Bronx Bombers. The brand is the title sponsor of the Dugout Lounge, which is above the third baseline (left field - opposite from where the DKNY billboard stands). The lounge is specifically for suite holders, so fans who can equipped to spend in expensive attire. There will be food, drinks, live streams of games in high definition and DKNY runway and advertisement reels on rotation. DKNY and Yankees may reach out to the community using charitable programs and activities to appeal to consumers on all levels, not just those in the luxury suites at the stadium. Bringing together timeless yet fresh fashion and America's past time is match made in sartorial heaven because of all the endorsement options available. In a global connected market it makes sense to reach out to multiple demographics in such a public way. The DKNY billboard above the bullpen will make its début in New Yankee Stadium on April 13th, the first home game of the Yankees' 2010 season. Donna Karan herself will attend batting practice, no word if DKNY will be making bats and gloves for its namesake to sport on the field.